Shane van Gisbergen stayed on top of the Supercars tree, but that wasn’t the main talking point in Tassie. The Supercars series is rarely short on drama, but last weekend at Symmons Plains took things to a whole new level. Yes, Shane van Gisbergen won a race and retained his series lead, and yes, Jamie Whincup took home a pair of podiums and a pole position from his weekend’s work. But all SVG, J-Dub, the Red Bull Holden Racing Team and – quite frankly – everyone else could talk about was one of the biggest accidents in the sport’s history in Saturday’s Race 3, one that left drivers battered and bruised, cars broken into bits, and jaws on the floor for those at the circuit or watching at home. SVG had just taken the lead of the race on lap two when Chaz Mostert ran wide on a surface slick with rain but being brightened by the late-afternoon sun, and as the field thundered down to the Turn 4 hairpin, visibility was close to non-existent. And then it happened, a high-speed multi-car shunt on one of the thinnest, fastest ribbons of racetrack in the country, and one where, mercifully, most escaped unscathed. The stats were bad enough: 12 totalled cars, with not a lot of change out of $5 million. Will Davison ended up in hospital with a suspected fracture of his lower back after taking the hardest hit. As well as Davison, James Courtney,Taz Douglas and Rick Kelly had their destroyed cars withdrawn for the remainder of the weekend, with several teams pulling all-nighters just to fix their machines for Sunday. Monumental doesn’t even begin to describe it. The race was red-flagged while the track was cleaned up, and when it eventually re-started, the time-limited race managed just one more lap behind the safety car before it was called, leaving SVG with a win, J-Dub second, and Craig Lowndes third for an all-Triple Eight podium that nobody wanted to even acknowledge. No championship points were awarded, and all the drivers could talk about was what SVG succinctly summarised as “a pretty ugly day. 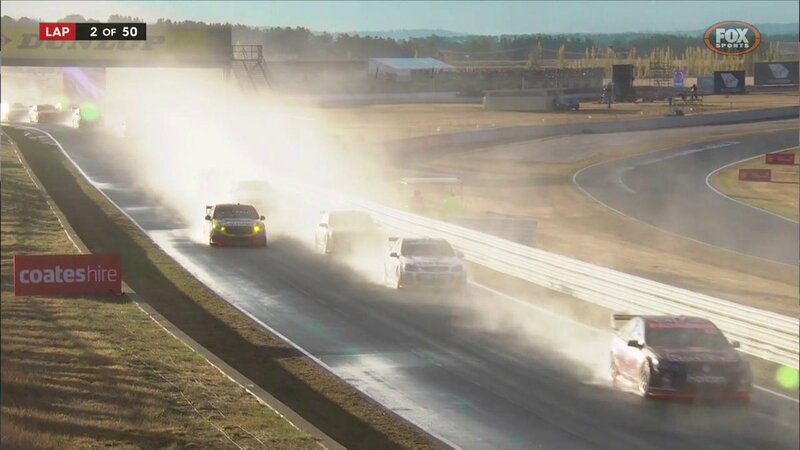 A patched-up grid of 22 cars turned up at a soggy Symmons Plains on Sunday, with rain lashing the circuit and causing the 20-minute qualifying session to be delayed. Whincup took the honours from Fabian Coulthard, the Kiwi penalised 35 championship points for triggering Saturday’s pile-up, but in the race it was a Coulthard-led 1-2 for the DJR Team Penske ,Scott McLaughlin finishing second ahead of Whincup, the top three covered by 1.1 seconds after 76 laps. Lowndes was next, right in Whincup’s wheel tracks, while SVG battled back to ninth after taking a 15-second time penalty at his second pit stop for a clash with Todd Kelly. “I was running behind Todd, I saw him lock up and I didn’t think he would make the corner. I wasn’t trying to pass, he just cut in on me,” SVG said. Whincup was thankful that his team left Tassie with relatively straight cars after a dramatic weekend. “We didn’t maximise in that final race, we probably should have won,” he said. The next chance to do just that comes at Phillip Island in just two weeks’ time, with SVG leading the series standings with 384 points, 20 more than Coulthard in second, while Whincup is third, 51 adrift of his RBHRT teammate. Lowndes moved from eighth after the Clipsal 500 to seventh, 96 points behind the defending series champion.